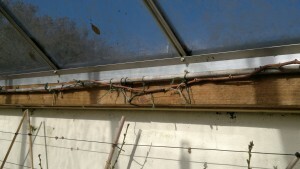 Our two main glasshouses, which are mounted against a more or less south facing wall, are used for various fruits. In the summer they house part of our tomato crop as well as, variously, aubergines, cucumbers, tomatillos, peppers, and such like. Amongst the permanent planting, we have one vine in each, two figs in one, and two peaches trained against the wall in the other. The peach house also has one recent addition, which we will train against the end face, although it remains to be seen exactly how it will be supported. This latest addition came as a free replacement for a supposed pêche de vigne, which was, when it fruited, found to be quite a different sort. 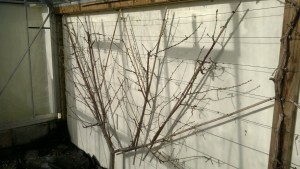 With spring around the corner, and the peach buds shortly to open, it was time to give things a bit of a tidy. The first task was to tidy up the vines. 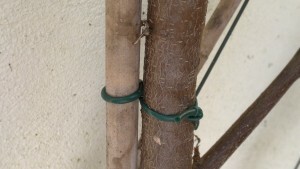 These are trained following the rod and spur approach, where a permanent structure is tied in and each season new growth emerges from the nodes along the main branches. The new growth is tied in, and each shoot is typically allowed to bear one bunch of grapes, being pinched out a few leaves past the first cluster of flowers. 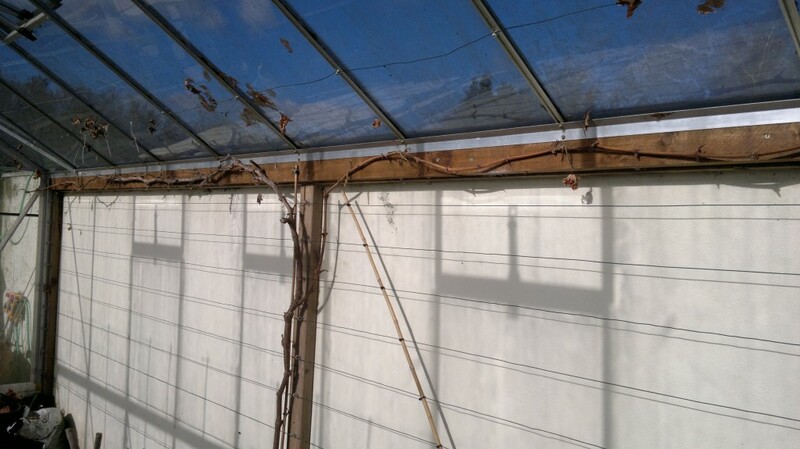 The rods are trained vertically against the wall in the centre of each glasshouse, and then divide in both directions to run along the ridge, thus keeping the walls free for the peaches and figs. With the leafy growth and bunches of grapes tied in up the north facing slope of the roof, they do not shade the rear walls. The grapes ripen rather late in the year, particularly on the Muscat of Alexandria. This was a commonly grown sort amongst the old walled gardens, where they would benefit not only from the warmth of a south facing wall but would often be heated with hot water pipes in the spring and autumn to ensure that the crop ripens properly. This variety is somewhat marginal without that extra heat, but in our southerly locale and with a favourable position, the grapes can just about make it. Of course, I could have picked an easier variety to work with, but there was no choice for me – I wanted to grow this variety for its historical interest as much as for the fruit. As the growth is pinched back early in the year, and then secondary growth and excess leaves removed to help the crop ripen later in the year, there is not so much to deal with. However, one must be careful with vines, as pruning cuts can bleed quite excessively. The best time to prune would have been shortly after leaf fall. The buds will no doubt burst forth in a few weeks, so there may well be some bleeding this year, but I hope it will not be too detrimental. 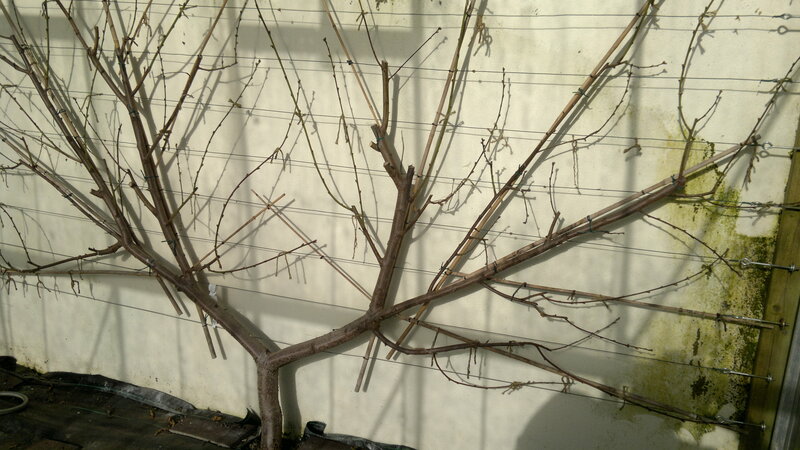 Most of the pruning was done on just one of the rods, as the others did not bear much last season. The side growth was pruned back to buds near the main branch. I have the main branches tied at intervals to screws fixed to the timbers that run along the eaves holding the glasshouse to the wall. On the youngest of the rods, the growth was still rather thin and not inclined to behave, so we tied first a cane to the screws, then were able to tie the rod to the cane, which will help to keep it straight. It is sometimes recommended to lay the rods down during the winter, with the idea of improving bud break along the whole length in the spring, but I have not yet done that; when more mature, I will probably untie two thirds of the length of the rods at the end of the season. 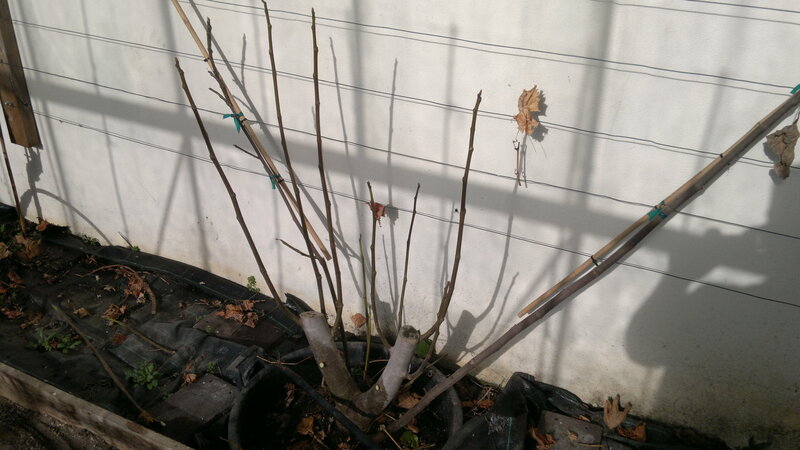 One of our figs was cut back rather hard after fruiting, and has since developed a large number of new shoots, two of which were tied in last year. We looked over the remaining shoots, which still need to be tied in at some point, and pruned out those that were either poorly placed or surplus to requirements. Finally, we worked over both peach trees. Stone fruits are not pruned when dormant, as they are susceptible to disease. However, the ties around the permanent framework had become rather tight, so we cut all of these away and retied more loosely using a flexible plastic tie that allows for some stretch. This is a lot easier to do in the winter, than when in leaf. The pruning last summer was quite harsh, so it was good to see plenty of fruit buds swelling.